The 2019 Hackaday Prize, which was announced last week, is very much on everyone’s mind, so much so that we’ve already gotten a great response with a lot of really promising early entries. As much as we love that, the Prize isn’t the only show in town, and we’d be remiss to not call attention to our other ongoing contest: The Flexible PCB Contest. The idea of the Flexible PCB Contest is simple: design something that needs a flexible PCB. That’s it. Whether it’s a wearable, a sensor, or a mechanism that needs to transmit power and control between two or more moving elements, if a flexible PCB solves a problem, we want to know about it. We’ve teamed up with Digi-Key for this contest, and 60 winners will receive free fabrication of three copies of their flexible PCB design, manufactured through the expertise of OSH Park. And here’s the beauty part: all you need is an idea! No prototype is necessary. Just come up with an idea and let us know about it. Maybe you have a full schematic, or just a simple Fritzing project. Heck, even a block diagram will do. Whatever your idea is for a flexible PCB project, we want to see it. The Flexible PCB Contest goes through May 29, so you’ve got plenty of time to get an idea together. Digikey might wow us with their expansive stock, but now they’re wowing us with a personal gesture. The US-based electronics vendor is nodding its head in approval to KiCad users with its very own parts library. What’s more, [Chris Gammell] walks us through the main features and thought process behind its inception. With all the work that’s going into this library, it’s nice to see features showing that Digikey took a thorough look at KiCad and how it fits into the current state of open-source PCBA design. First off, this library follows a slightly different design pattern from most other KiCad libraries in that it’s an atomic parts library. What that means is that every symbol is linked to a specific manufacturer part number and, hence, gets linked to a specific footprint. While this style mirrors EagleCad’s; KiCad libraries usually separate symbols from footprints so that symbols can be reused and parts can be more easily swapped in BOMs. There’s no “best” practice here, so the folks at Digikey thought they’d expose the second option. Next off, the library is already almost 1000 parts strong and set to grow. These aren’t just the complete line of Yageo’s resistor inventory though. They actually started cultivating their library from the parts in Seeed Studio’s open parts library. These are components that hobbyists might actually use since some assembly services have a workflow that moves faster with designs that use these parts. 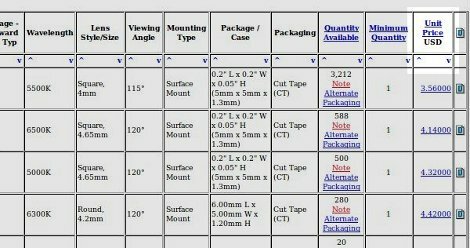 Lastly, since all parts have specific vendor part numbers, BOM upload to an online cart is more convenient, making it slightly easier for Digikey to cha-ching us for parts. With maturing community support from big vendors like Digikey, we’re even hungrier to get our hands on KiCad V.
As many readers may already know, when I’m not featuring your projects or working on the mooltipass I try to make simple things that may be useful to electronics enthusiasts. My latest creation is a simple bill of materials generation tool, which can also do simple stock management. Unfortunately for Linux users, this utility is made using Visual Basic functions in an Excel file. It works fairly simply: just enter your schematics’ components references in the excel sheet, along with the corresponding Digikey webpage address. Click on the “fetch” button and the script will automatically get all your component characteristics from the internet and tell you the component costs depending on the number of prototypes you want to make. Then click the “sort BoM” button and your BoM will automatically be sorted by component type and value. Another functionality allows you to check that all the components present in your BoM are also present on the (very simple) Kicad generated one. Finally, using another Excel sheet containing your current stock, the Bill of Materials will let you know if you have enough components for the assembly stage. A video of the tool in action is embedded after the break, and you can download the BoM template here (.XLSM file) and the corresponding stock file there (.XLSM file). 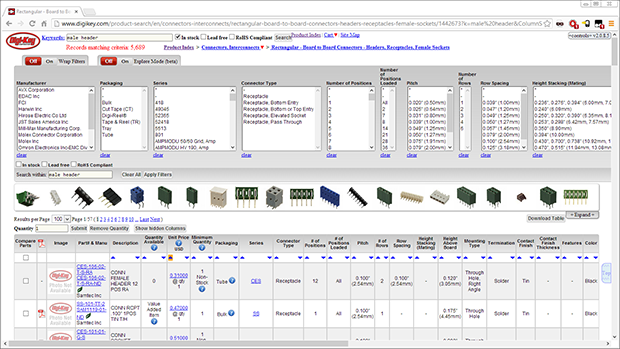 We all love Digikey, but of all the major component retailers out there, their web interface really isn’t that great. A lot of online sources for parts are much, much prettier, but nothing a good Greasemonkey script can’t fix. This is all the work of [Ben], and adds a ton of really, really useful features to the Digikey web interface. First up is a whole bunch of pictures right at the top of the search results. If you’re looking for pin headers or weird connectors, this is an astonishing useful feature that will help you select the right part faster. After that is a ‘helper’ button for voltages. As you know, selecting a part with a 5V input requires clicking multiple options including 3.3-5V, 2.3-6V, and 5-40V. Clicking on the helper button and entering 5 V will select all the entries in the filter that contain a 5V part. [Ben]’s project has been tested with Firefox and Chrome with Greasemonkey extensions. Head on over to his project page for a much better demo of all the features for this really great tool. Does anyone else find it a little ironic the electronic retailer SparkFun is advocating scripts to help Digikey have a Sort By Price function? Regardless, to reiterate now Firefox (and we hear Google Chrome too) users with the Greasemonkey plugin can sort Digikey items. Personally, some of us here are just Mouser fans at heart. 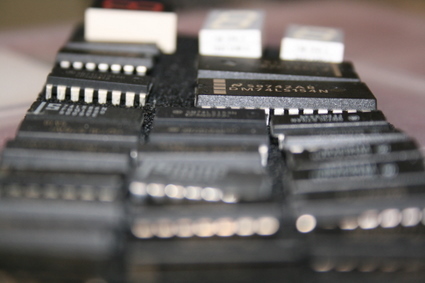 Hunting down the right parts usually takes more time than soldering everything together. I can’t count the number of projects that I tried to build and couldn’t find some key component that’s no longer made. You can help put together a list of suppliers at the end, but the idea is to have a quick reference to get your projects rolling (saving your money for important things, like espresso). Even if you’re familiar with the usual electronics parts shops, chime in to help me create a list of the best suppliers to fuel those hardware hacking projects.